If there is a single bolt that characterizes Muntz' prose, it is his deftness in scripting visceral and verdant images. After the popular reception of his first book, Voices, his second book, Sunshine in the Valley is hardly a sophomoric followup. Muntz has an undeniable metaphysical sensibility in his writing that is not heavy and hard to digest like the poetry of John Donne, but seems to operate at the level of the verb, putting him in the more lively and animated (if not animist) tradition of the stoics and their peculiar logic. Although the text resists the brute force of allegory, it is difficult not to make a host of associations that mark this novel with a possible future extrapolated by our own fascination with the digital realm where all our interaction with the real becomes a series of mobile screens, littered with visual signs that can be manipulated, and the very idea of possessing a body or having a body in space is super-sublimated in a kind of complete integration. Yet, one may wonder if the staunch and arrant protest against allegory actually smuggles allegory through the back door, even if it is the reader who imposes his or her will upon the text to force an allegory into life. The novel is set in a future that has no connection to the past we understand, almost as though human time was rebooted. 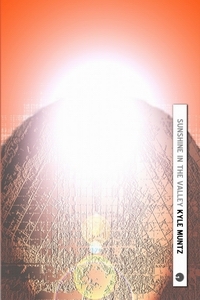 In this valley are semi-selves, childlike beings whose self-concept is integrated with the appurtenances of their environment: living walls surrounding a valley and the limitless sun. Life itself is inscribed upon the space of the valley within these walls. The sun that diffuses itself freely takes on the character of a sort of mono-theological entity (although the theology in the novel is almost entirely one of poetic interaction between beings and the environment). But there is trouble in this fabulist utopia as the characters begin to pose the very metaphysical questions that fracture their innocent relationship with the world in which they have for so long lived and taken as given. Muntz' world is composed of six layers, and these are explained after the somewhat shocking assertion that those who live in the valley are really the shadows of another sun and another valley. Yet, we cannot assign some crudely Platonic division here as though the valley-dwellers are simply the clueless watching the shadows on a wall and in want of some philosopher to bring them out of this cave and blind them with the sun's light of truth. The first layer upon which perhaps the entire universe is built contains nothing, but it is a nebulous and vague nothingness that we can only conjecture about. The second layer is the two-dimensional space where movement is nearly impossible. The third layer would be the empirical world, and this is heavily stressed as the world of the senses and interpretation thereof when Muntz writes: "The properties things have here apply everywhere, but they don't always mean the same things. When you look close enough, if you want, you can see dots, or blocks, or colours." This third layer is almost atomistic, and the component parts are governed by rules that apply universally, yet what is missing is some substratum of meaning to make these components connect which is most likely the province of another layer. The fourth layer contains time, but a very special type of time: this is the time of all possibility that exists in exclusive segregation where one can access the different possibilities of existence itself. The fifth layer is by far the most audacious mind experiment since it contains absolutely everything in every configuration which renders the actual division of objects and times impossible. The best way to understand this layer is by recourse to quantum physics and the idea of the complete superimposition of all matter, energy, and information in every possible state. The last layer mirrors the first, but is the domain of energy. It is the dynamo of all layers, yet is also a "space" of nothingness that completes the universe-as-sandwich. There is a cleverness in the way Muntz is able to blend a variety of philosophical systems into a kind of harmonious whole, and yet also make the contradictions forms of suspension or tension between them all that actually generate the reality of this "world." This is performed without dogmatism or pedagogical airs, and this keeps the book in its proper place as though written on the lightest of feet. This is not to deny Muntz' evident vertiginousness of his dynamic wordplay that seems to provide brilliant slashes of colour upon an expansive literary canvas. As a novel, it does not belong anywhere, and perhaps it belongs everywhere - as mystical a contradiction as the universe he so carefully constructs. But it is a universe constructed to appear as the most simplest and natural of images. The vivid display of language is also entirely free of ostentation, and it is this that does not present us with merely a decorous arrangement of itinerant phrasings designed to show us how "literary" Muntz is. We know that he is inherently literary and poetic, and his works (I would include Voices in this assertion) are not strong-arming the reader; there is a kind of polite and whimsical invitation for us to play as we read, and this lends a kind of innocent self-effacing quality to the way he writes. The natural flair he has for espaliering the objects and phrases across almost Borgesian landscapes, coupled with his knack for the more profound metaphysical reflection truly makes the novel shine forth in a radiance unique and all its own. This is, as far as experimental literature goes, an experiment that produced a fabulous and superb result that could never be repeated in any literary lab anywhere.